I picked this one up on an impulse, wild and crazy book-consumer that I am. 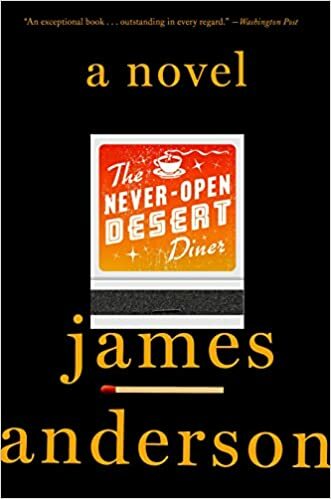 I found James Anderson’s The Never-Open Desert Diner a book with many virtues, but not enough of them to be entirely satisfying. Ben Jones is an independent trucker, not quite making a living as the sole delivery service for a particular stretch of highway in Utah. He has this monopoly, not because of superior business skills, but because nobody else wants the route. It’s very remote, its few inhabitants mostly cantankerous loners. His best friend is Walt Butterfield, the ornery old owner of The Well-Known Desert Diner, which is never open. Walt faithfully renews his restaurant license every year, but if a customer shows up he runs them off. He’s been that way since his wife was raped and murdered decades ago.